Obi the Wonder Dog here. It's hard to believe, I know, but it's time for another monthly newsletter. 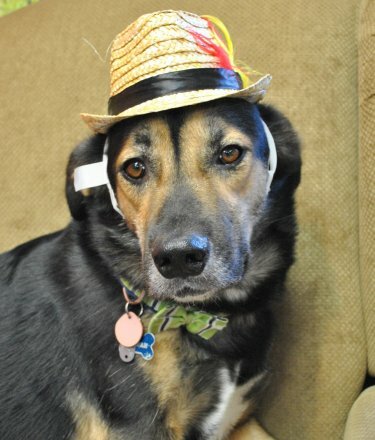 Today, Mom dressed me up in a fedora. She said it goes nice with my bow tie. I wasn't too overly thrilled about being dress up as Dapper Dog for Halloween. The hat stayed on until the photo shoot was done. Mom could've at least taken the tag off. I look like Minnie Pearl's dog. Now onto to something more interesting. Like chasing squirrels as they run across the top of the fence in the back yard. Those nice days we had were great! Mom & Grandma left the back door open so Moda and I could run in and out. I had the zoomies several times a day and kept customers entertained zooming around the Shop with Moda hot on my heels. There's not much new happening. 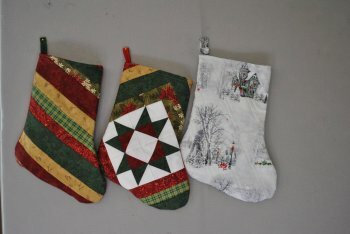 We have some new Christmas patterns for runners and tree skirts in. We also have a new Real Tree Panel and coordinating fabric that came in this month. Our big news is the success of collecting Hurricane Quilts. 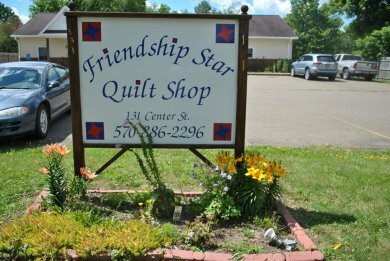 We collected 33 Hurricane Quilts, 80 pillowcases & 8 fleece blankets made by the Broome County 4-H kids. They are being sent to Texas, Florida, Puerto Rico and Virgin Islands. We would like to send out a big heartfelt "Thank You!" to everyone that took the time to make a quilt or two to send out. It is greatly appreciated. I'm sure the people receiving them will be grateful as well. November 1-11, 2017, Select regular priced Northcott fabrics will be 45% Off! There is a min 1 yard cut at these prices. 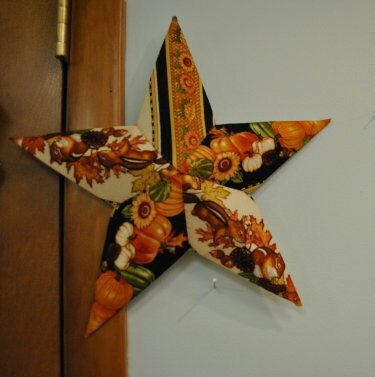 This fabric 3-D star was made by Carolyn P. The chipmunks are my favorite part of the star. I haven't been able to find one in the backyard yet. Mom said she had one sit on her shoulder one time while she was out hunting. She said they are cute. I'm thinking they would be fun to chase around the yard. We have this pattern, "Wall Art Stars Pattern" available. It can be made into 13", 20" & 25". Carolyn made the 20" star. She made another one for her husband out of stars and stripes. She couldn't get it away from him to bring it to show it off. We also have the 10" X 10" pre cut square stablizer and we also have a stablizer in yardage that can be used to make the stars. Before I forget, again. Mom has made contact with a fellow who teaches a 3 day class on how to restore Vintage Sewing Machines. He is from KY and would be willing to come up and teach his program if we have enough people interested. He will teach you how to restore your Vintage Sewing Machine. You must have your own Vintage Sewing Machine to restore. The Program is around $70 and you will go through his website to sign up for the class. If you are interested, please, let my Mom know. The class would be held in our classroom. She would like to make sure she has enough people interested in taking the class before she makes arrangements to have him come up. I would also like to take a moment to remind everyone that since the sewing season is upon us, this would be a good time to have your sewing machine serviced. A friend brought her sewing machine in to have Mom service it. She is a very busy quilter. She sews almost everyday year round. The bottom of her sewing machine was packed full of lint. 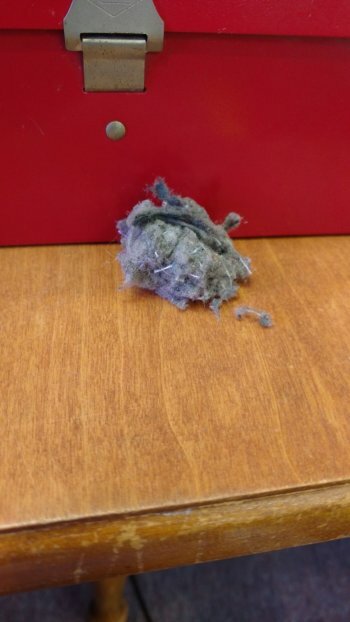 Mom didn't get a photo of the lint before she took it out of the machine but our friend took a photo of the lint ball after Mom took it out of her sewing machine. The packed lint is about the size of a small mouse. Here's a photo of the lint "mouse" Mom took out of our friend's sewing machine. Servicing your sewing machine on a regular basis can save you money in repairs. It also keeps your sewing machine working at it's peak performance. All that lint bogs down your sewing machine and creates stress on the gears, shafts and belts. I think I have covered everything Mom wanted me to. I think it's time for a treat break. Maybe I can get Mom to fill the center of one my bones with peanut butter for me. I love it when she does that! I love peanut butter! I even have my own jar of it here. Mom marks it so no one uses my special peanut butter. If we don't see you....HAVE A HAPPY THANKSGIVING!!!!! I look forward to all the belly rubs and ear scratches you give me when you visit.